March 24, 2016 - Transport ministers of Australia and Malaysia strongly believe that the two aircraft parts that have been found in Africa are from Malaysia Airlines Flight MH370 that disappeared from radar in March 2014 with 239 onboard a Boeing 777. Back in February, an American tourist, Blaine Gibson while on the sandbanks in the Mozambique Channel, between Mozambique in eastern Africa and Madagascar found an aircraft part of an aircraft horizontal stabilizer. That part was then examined by authorities and believed to have come from a Boeing 777. The news media published the story and suggested it may have come from Flight MH370, which prompt another individual, Liam Lotter to come forward with his find. Lotter had visited the sandbanks with his parents when he found a grayish object. His parents took it as a object that washed ashore and nothing more. But when the story broke about Gibson's find, Lotter appealed to his parents to bringing it back to South Africa and present it to investigators. 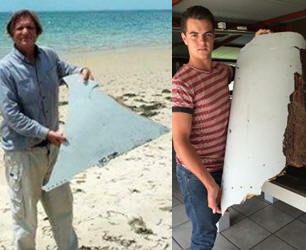 Lotter's find was just 300 kilometers from where Gibson found a part from aircraft horizontal stabilizer. The two aircraft parts have been analyzed in Australia and it is now believed that the parts came from a Boeing 777 and it is most likely from Malaysia Airlines Flight MH370. That is now the thinking of the transport ministers of Australia and Malaysia. Transport Minister Darren Chester said today "The analysis has concluded the debris is almost certainly from MH370". "Close examination of the debris might possibly give some additional information relative to the search, but it's unlikely," said Dan O'Malley, spokesman for the Australian Transport Safety Bureau. Liow Tiong Lai, Minister Of Transport, Malaysia said, the Malaysian ICAO Annex 13 Safety Investigation Team has advised that the dimensions, materials and construction of both parts conform to the specifications of a Boeing 777 aircraft. The paint and stenciling on both parts match those used by Malaysia Airlines (MAS). Lai, continues, as such, both parts are consistent with panels from a MAS Boeing 777 aircraft, and almost certainly are from MH370. The location where both pieces were discovered in Mozambique are consistent with the drift modeling performed by the Australian Commonwealth Scientific and Industrial Research Organization (CSIRO). Malaysia Airlines Flight MH370 was a scheduled international passenger flight that departed Kuala Lumpur International Airport, Malaysia, for Beijing Capital International Airport in China on March 8, 2014, at or about 12:42 Malaysia Time (MYT) with 12 crew members and 227 passengers onboard a Boeing 777-200ER. Flight MH370 last made voice contact with air traffic control at 1:19 MYT. The aircraft then disappeared from radar.